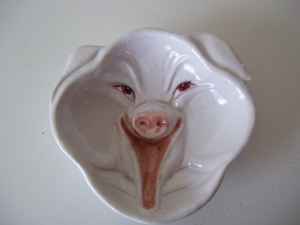 I saw your ad on Craigslist for the Pig Face Candy Dish http://montreal.en.craigslist.ca/hsh/2162106744.html. It is a very special looking item. I think it would go great in my living room full of candies. My grandchildren could come over and take candies out of the bowl slowly uncovering the face below. I can just imagine their squeals of joy as they realize that the candy bowl looks like a mask that might be worn by someone fabricating an article of clothing out of human skin.